Over the years a number of surveys have concluded that, despite progressive improvements, the UK five-year survival rates for common cancers are worse than the European average by 5 to 15%. The most recent of these has just emerged, comparing survival from four of the most important cancers – breast, bowel, lung and ovarian – at one and five years following diagnosis between 1995 and 2007 in the UK, Denmark, Norway, Sweden, Australia and Canada. Their conclusion was that, despite improvements in survival rates, the disparities remain and that the life expectancy of cancer patients in the UK is shorter than in other countries. Before we get too downcast by these facts we should note that the UK five-year survival rate for breast cancer, for example, has now reached 82% whereas 40 years ago it was 40%. However, the UK clearly has a problem for which there might be three broad causes: (1) later diagnosis, (2) more aggressive forms of the disease, (3) variable standard of treatment. It seems probable that all three play a part. Where you live in the UK bears significantly on your cancer risk. The National Cancer Intelligence Centre has produced a Cancer Atlas that compares incidence and death rate from the 21 most common cancers in different counties of the UK. The differences reflect levels of smoking, drinking, poor diet and social deprivation and show that regions of northern England and Scotland are cancer ‘hot spots’. Their estimate is that if the worst areas could be converted to the best there would be 25,000 fewer new cases and 17,000 fewer deaths a year: with about 156,000 cancer deaths per year that would represent an 11% decrease. One sensible plan might be to concentrate cancer care into a smaller number of centres of expertise, along the lines of what has been proposed for heart disease. 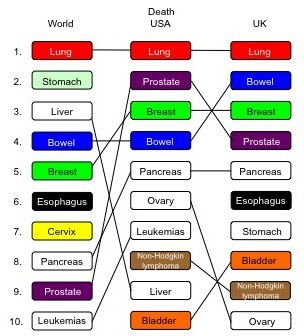 World, USA and UK cancer deaths 2008. Coleman, M.P., Forman, D., Bryant, H., Butler, J., Rachet, B., Maringe, C., Nur, U., Tracey, E., Coory, M., Hatcher, J., McGahan, C.E., Turner, D., Marrett, L., Gjerstorff, M.L., Johannesen, T.B., Adolfsson, J., Lambe, M., Lawrence, G., Meechan, D., Morris, E.J., Middleton, R., Steward, J., Richards, M.A. and the ICBP Module 1 Working Group. (2011). Cancer survival in Australia, Canada, Denmark, Norway, Sweden, and the UK, 1995—2007 (the International Cancer Benchmarking Partnership): an analysis of population-based cancer registry data. The Lancet, 377, 127–138.